These three cameos will be offered in Bonhams’ September Fine Jewellery sale in London, which features The Ceres Collection of historical cameos and intaglios. London–The Bonhams Fine Jewellery sale scheduled to take place in London in September features a collection of rare and historic cameos and intaglios dating as far back as the 4th century B.C. Known as “The Ceres Collection,” it’s made up of more than 101 engraved cameo and intaglio rings, worth an estimated $171,568 in total. It will be sold without reserve. An American family assembled the collection over a 60-year period, from the 1930s to the 1990s, with the pieces ranging in date from the 4th century B.C. to the Renaissance period and through to the 19th century. The engraved gems depict a broad range of subjects in miniature, including gods and goddesses of the ancient world and portraits of historical figures. All have been mounted into rings to make them wearable pieces of jewelry. The oldest piece is a 2,500-year-old Hellenistic garnet cameo of a head, dating from the 4th century B.C., expected to sell for up to $8,579. Also expected to garner the same price is a Renaissance Revival gold, enamel, and agate cameo ring from the mid- to late-19th century that depicts Brutus on a neo-Renaissance gold mount. The sale also includes a cameo depicting a Roman lady of high rank–the “pièce de résistance,” according to Bonhams–expected to sell for up to $3,431. 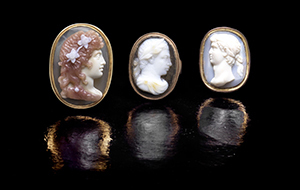 The cameo gem dates from the 1st to the 2nd century A.D., surviving as a fragment that was repaired with gold in a later “Roman” setting. Other highlights from the sale include a cameo of the emperor Tiberius, carved from a large piece of translucent orange hessonite garnet circa 18th-19th century, expected to sell for between $3,431 and $5,146. A Roman intaglio of Diana, goddess of the hunt, carved in fire-orange carnelian with her quiver of arrows circa 5th century A.D. is expected to sell for up to $2,574, while another Roman intaglio of Ceres, the goddess of fertility and harvest, with a cornucopia and ear of corn carved from red carnelian, is expected to fetch between $1,030 and $1,373. “Since ancient times, cameos and intaglios have been regarded as the discerning person’s status symbol. With the sale of The Ceres Collection of 101 exquisite rings, Bonhams hopes to attract a new generation to appreciate the art of gem engraving,” said Emily Barber, director of Bonhams Jewellery Department.